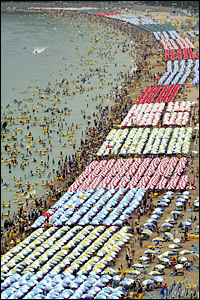 Rows of parasols installed at Haeundae Beach in Busan will be listed in the Guinness Book of World Records for the largest number of such an installment, the seaside ward office said Friday. On Aug. 2, the ward office will count the numbers of the parasols set on the beach from 10 a.m. to 5 p.m. hourly and report the highest number. Staff from the Korea Record Institute working with the Guinness Record headquarters will be there for the verification. The office assumes about 12,000 parasols is expected to be set up along the 1.5 kilometer-long beach at the peak of the holiday season ― end of July and early August. ``We think about 2-4 p.m. will be the time to break the record,'' an office spokesman said. The office is also seeking to enlist another tourist attraction ― largest sand painting. On Aug. 3, painting experts and citizens will make a 920 square meter painting with 300 kilograms of colored sand. The current record holder is a 859.42 square-meter Spanish piece made in 2007.